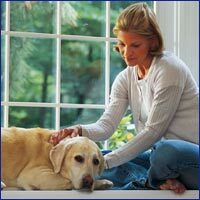 provides early medical assessment and interven­tion and even occasional assistance with food for pets of the terminally ill in portions of Falls Church, Arlington and Alexandria counties. If you know someone who is terminally ill and needs to arrange foster care or an adoption for their pet, please contact us. If you would like to foster or adopt a pet, please read “things to consider” below and then fill out the online application. After we receive your application and have time to review it, we’ll contact you. Most adoptions will be arranged through the Cherrydale Veterinary Clinic in Arlington, VA. Web design & development by Charlotte's Web Studios, L.L.C.